"Re-using structures from our Industrial Heritage"
The Weir, Manual Sluice Gate and Head Race have been in place for many years having been built in order to harness the water from the river to drive the Water Wheel to power the equipment in Bridge End Mill. It is still possible, via a small manual sluice gate adjacent to the rear of the Power House, to divert water to the Water Wheel (which will still turn although it is has been disconnected from any machinery!). This is done a couple of times a year to flush the Mill Race beneath the Mill which if left to stand for too long can become a bit smelly!! Settle Hydro has 're-used' and adapted these original structures in order to generate water power from the River Ribble once more! 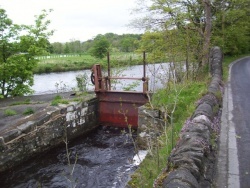 The Manual Sluice Gate is left in the open position during 'normal' running. When very high river levels are anticipated, we may take the decision to partially lower the Gate in order to restrict the flow and reduce the risk of flooding and swamping the Head Race and Power House. 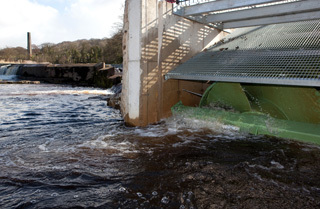 The Manual Sluice Gate may be fully closed if we need to drain the Head Race for maintenance purposes and it also acts as an emergency back-up should the Automatic Sluice Gate get stuck in the open position. 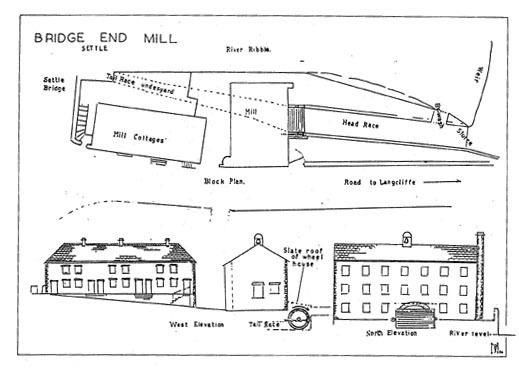 The original Head Race took water to the Water Wheel and then under Bridge End Mill to rejoin the river just before Settle Bridge. 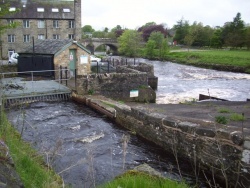 The outflow from the original Mill Race can be viewed from Settle Bridge. 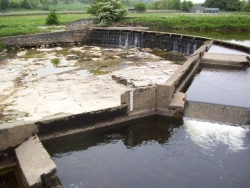 Settle Hydro has diverted water from the original Head Race to flow through the Automatic Sluice Gate, under the Power House and down the Archimedes Screw. 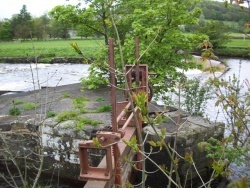 A Screen of vertical bars (spaced approximately 20cm apart) has been positioned in the Head Race ahead of the Automatic Sluice Gate and Screw. The purpose of the Screen is to prevent large debris (branches, buckets, tyres, dead sheep!) from being dragged through the screw and causing damage. The Screen has to be cleared every day when the Hydro is operating as accumulated debris will significantly reduce the output of the Hydro. During the Autumn months when a mass of leaves are falling into the river, the screen may have to be cleared two or three times a day. The clearing operation is performed manually with a rake.